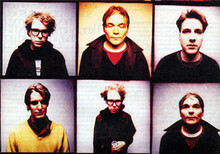 Ten years after their tumultuous breakup, Pavement is more popular than ever. After years of “not being ready,” lead singer Stephen Malkmus finally agreed to a reunion. Now, with a handful of U.S. dates and the European leg of the tour behind them, Pavement returns to the U.S. for a special homecoming show in Stockton on June 24th, followed by a performance at the Greek Theater on June 25th. SF Station spoke with guitarist Scott Kannberg about the group’s reunion. SF Station (SFS): I read a review that suggested you’re playing better because there isn’t the tension that once was pulling the group apart. Is there any truth in that? Scott Kannberg (SK): With Pavement, we always did everything that people asked to do. We’d go to a town after traveling eight hours and go do three hours of interviews; that stuff just starts tiring you out and making your grumpy. There was definitely some tension in Pavement at the end, but I think it was just people were not having fun. At the time, I didn’t like to accept that was what was going on, but I wasn’t very happy. SFS: There is an emphasis in everyone’s responses during interviews that your booking agent made this reunion happen. SFS: You’ve repeatedly expressed publicly a desire to get back together. Did your booking agent play a part in convincing Stephen? SK: I think he did. I think Stephen just needs somebody to convince him. [laughs] I think he knew he wanted to do it, but he just wanted everyone else to say they wanted to do it. Whatever. SFS: Was money a reason? SK: Not really. For some members of the band it probably was a little bit of an issue. SFS: Is the band a better fit now? SK: It’s different. When you take time away from it, and do other things in some ways it’s a better fit, but you’re still playing old songs. In the old days we had a new record to promote, and we’d play new songs along with the old songs. SFS: Are you and Stephen as close as you once were? SFS: Was there an awkward rehash when you first sat back down together? SFS: Have you thought about joining any fantasy sports league [Stephen has a fantasy sports addiction] with him? SK: No, he wants me to, but I don’t really do that. The only sport I really like is baseball, so I could probably do that. SFS: How have you reconnected with Stephen? SK: I don’t know, I think it’s more just normal life stuff. What stuff to people bond over really? SFS: I’m trying to see where you might still have commonalities. SK: I think it’s growing up together and knowing what someone is like. He’s got a family and basically he talks to his family on Skype everyday, and sits on his computer and does fantasy sports, and then does the show. The whole band is not connecting in a way like we’re a new band. We’re doing this for the fun of it. 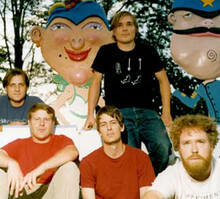 Pavement perform at the Greek Theater on June 25th. Tickets are $39.50. The show begins at 8pm.